Below I'll endeavour to make a small cross section of recent history in the British Travel sector to try and nail the zeitgeist of tourist's decisions. They're a fickle lot and word of mouth plays a large part in trending; people don't tend to believe what the newspapers say, much less act on it - having had links to this site printed and published prominently online, they didn't raise the hit-count to the site one iota! In all of this, people searching for news of a British Staycation have to run the gauntlet of probably the biggest British Holiday Website sending them....abroad. You couldn't make it up. July 2014: ThisIsMoney hi-liting Skegness & Cleethorpes in the top ten of inexpensive competitively priced resorts, and that swapping for the neighbouring town to the resort can shave Big Buck$ off the price of a stay...so there's hope for Mablethorpe yet..
July 2013: Travel Industry Surveys showing a shift to UK City breaks amongst the more predictable National Parks & resorts...Lincolnshire not even figuring in people's psyches. Oct2012: The Independent hi-liting the damage second holiday homes are still inflicting on Wales. March2012: The Government drafting in Stephen Fry & Julie Walters to try and get people to take 'discounts' of 20.12% on vacations in the UK in the Jubilee Olympic year....then giving everybody conflicting advice to KEEP OUT of London, which they all heeded....the Joys of a Coalition..
Feb2012: Jet2 boss announces rosy expansion in Yorkshire in place of struggling Thomas Cook in the Foriegn Package Tour market. Feb2012: Steady rise in Northern Ireland vacations, but not to the Hotel sector - ...B&B & Guest Houses doing better. May2011: People opting for a staycation say they are doing so because they enjoyed their UK holiday last year and a 3rd said it would cut out the hassle of going to the airport. 3 out of 4 drive while 1 in 8 take the train and 1 in 33 fly. Mar2011: Travel Supermarket make a case for staycations now being in the psyche and habits of Britons, and that therefore they're liable to continue. July2010: Fall in value of the Pound causes rapid decrease in bookings for Foriegn Holidays. May2010: Eyjafjallajökull, Iceland's latest volcanic eruption, makes UK Staycations almost compulsory. 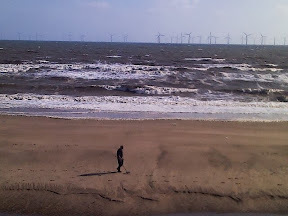 Dec2009: Blackpool confirm a good summer as 'VisitEngland' revealed that although cost remained dominant in destination choice, young people confessed to feeling almost embarrassed at their lack of knowledge of their own country, encouraging them to rediscover England ". 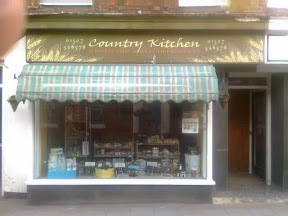 Jul2009: A boom for local industries and shops as fear of redundancy and recession fuels tourism through the Credit Crunch. Aug2008: The coining of the word "staycation", as the strong Euro and rising fuel costs put even Cornwall and Scotland out of reach. Mar2008: A Daily Mail reporter didn't do their research before embarking on a hilarious UK canal boat break in winter. May2007: The Royal Mail release a series of commemerative postage stamps celebrating the Great British Holiday. Feb2007: Zambezi? Mexico? Grand Canyon? New Zealand? , No they're stunning pictures around Britain. Sep2006: The 100th anniversary of the founding of the first British Holiday Camp at Caister On Sea near Great Yarmouth, East UK, by a Labour MP. Aug2006: The Conservative Party campaign to save The Great British Holiday in the face of new swingeing taxes being considered for accomodaters, on top of rates and V.A.T. 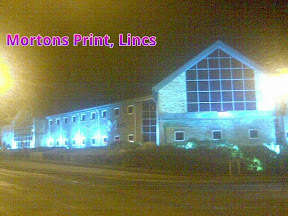 Mortons Printing Works in Horncastle, Lincs, UK. May2005: Outlines about the amount of compensation you can claim if your (Foriegn) Holiday is disasterous. Dec2004: The world tries to come to terms with the worst Tsunami in historical memory as thousands of tourists are unnacounted for on the Indian Ocean Coasts and Banda Aceh is decimated. Aug2004: A poll by Switch/Maestro credit cards showed that most people underestimate costs of travelling abroad, and that it's consistently 60% more expensive than a staycation. Jan2003: A foriegn individual is prosecuted and over a dozen fake british holiday firms shut down by the Department for Trade & Industry. Oct2002: Nearly 200 dead and C-130 Hercules transporting injured tourists to Darwin and Perth after the Bali Bombing. Mar 2002: The wintery Wolds featured as a Walk of the Month in the Daily Telegraph. Aug2001: Terror Outrages, War, Recession - but Mobile Phones causing the demise of the traditional smutty Postcard. Oct2000: The obituary of Sir Fred Pontin, who laboured in the Orkney Islands during the war before having the idea that people might be wanting to spend their demob money on a holiday. 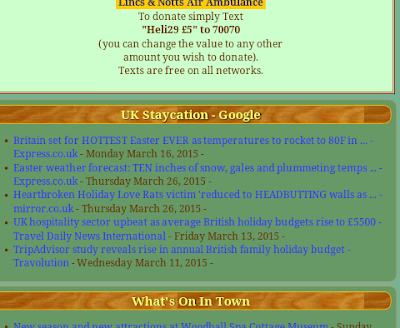 . .
Sept2000: Statistics for 1999 Uk Tourism trends, and a comprehensive archive of articles to present. Nov1999: EU's working time directive boosts UK holiday entitlement to 4 weeks paid leave, bringing it in line with the rest of civilisation just in time for Christmas. Nov1997: The Luxor massacre of three score tourists sees the Egyptian industry massacred too, as British Events unfold a year of losses and disasters, including the election of Tony Blair and the loss of Princess Diana. Jan1997: An Influenza epidemic during -21C temperatures put a break on the start of the year's Holiday figures.